Mobile Apps for Your Health | The Danya Institute Inc. Reviews of selected mobile apps for smartphones and tablets. Medscape, from WebMD, is a highly informative and interactive app devoted to clinicians across disciplines in the medical field. The app features an up to date Clinical Disease and Condition Reference of more than 4,400 physical and psychiatric diagnoses authored and reviewed by a team of 7,700 physicians and pharmacists. The Drug Reference contains more than 8,000 medications and is equipped with a Drug Interaction Checker that checks for mild to serious contraindications for up to 30 drugs, herbals, and supplements at a time. The app’s Medical Calculators allow clinicians to use formulas, scales, and classifications to help diagnose a number of different illnesses as well as access to dosing calculators for over 600 drugs. Another feature is access to Continued Medical Education/Continued Education courses to fulfill various licensure requirements. The Formulary Information section allows clinicians to customize their Medscape account with the health plans that they accept from Medscape’s list of over 1,800 insurance plans across the United States. In addition, app users are able to access the latest medical news on practice guidelines, FDA announcements, important journal articles from over 250 publications, conference news, business trends, and financial and malpractice advice. There is an option for offline access by downloading the clinical reference database so that users may browse without internet connection. A medical directory of more than 460,000 physicians, pharmacies, and hospitals by name, location, and specialty is included in the app. This app was rated 4.5 out of 5 stars by users in app stores and was the highest-rated free medical app for healthcare professionals in iTunes and Google Play. 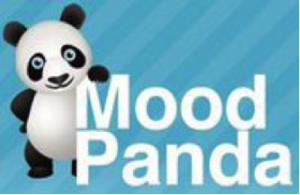 MoodPanda is a free mood tracking application for Apple and Android devices created by Jake Greenwood. It is an easy way to rate and track your mood, in order to see if there are any patterns in how your mood changes over time. You can generate a mood graph for use in therapy or just for your own knowledge. For instance, does your mood worsen every year in the fall? If so, you might have Seasonal Affective Disorder. The app allows you to rate your mood on a scale of one to ten as often as you like. There is an option to add a short text message to describe or explain the reason for your mood. Your name and mood ratings appear in a “World Feed” that enables other members of the MoodPanda community to give virtual hugs and to comment. The function to keep your mood private wasn’t working at the time of the review. Finally, although the app is free, it does ask you to donate money. A donation is the only way to become a “supporter” and change the panda icon or to put a medal by your name. This app is rated for users age 12 and above. At a boy! is an Apple app designed by psychologist and behavioral economist Dan Ariely from Duke University’s Center for Behavioral Economics. It generates compliments and allows you to give a thumbs up or thumbs down to each one. Doing so will supposedly allow the app to tailor compliments more to your preferences. It also allows you to submit your own compliments for other users. While I personally would not have my spirits uplifted by compliments delivered in such an impersonal manner, there are some reviewers who report benefitting from it. In addition, if you have a personal goal to say more affirming things to others in your life, this tool might give you ideas and inspiration. 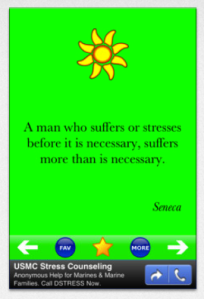 This simple Apple and Kindle app by Michael Quach delivers a series of inspirational quotes. You can select and save your favorite quotes or email them. I reviewed the iPad version, which doesn’t have ads. One reviewer did complain about the ads on the iPhone version. While it is not a traditional stress reduction tool, your stress level may be reduced by taking the time to reflect on higher priorities in life. In addition, some of the quotes may help put your problems in perspective. FatSecret is a free app that aims to help people get to a healthier weight and develop a healthier lifestyle. The app provides easy to read graphs and charts where you can easily see how your diet and exercise programs progress. You can keep a daily food diary where the app calculates the number of calories you have consumed. An exercise diary allows you to add the type of activity you did and for how long, and then the app will automatically calculate the calories burned and add that to a daily log. Another unique feature is a section for a personal journal where you can record your feelings for every food which you consume to help you make smarter choices next time. One unique feature of this app that I really liked was the section where you can share different recipes. From gluten-free to sugar free, you can browse through thousands of recipes that other users have uploaded. Every recipe comes with nutritional information. If you made and ate any of the recipes, you can add that recipe to your daily diary as well. Additionally, you can add your own custom foods, your own recipes, or foods from any popular restaurants. You can choose items from popular food brands or even supermarket brands. In addition to FatSecret being a mobile app, you can also log into it from their website which actually has many more great features. A section called “challenges” encourages you to reach your goal by selecting and completing a variety of challenges with other people who are also trying to reach the same goal. This is a great way to keep you motivated. One great section in FatSecret’s website version is their “community” section where you can connect with various other groups and users around the world who share similar goals. You can share your stories with someone else or even just ask a question or two about something you are confused about. This section also lets you read other people’s food journals to perhaps find tips for a successful diet plan. The interface of this app is very appealing but at the same time well organized and nicely maintained. Overall, I thought that FatSecret does exceptionally well at being a high-quality nutrition app that is easy to use and offers some great ways in which an individual could develop a healthier lifestyle. Fooducate is an app created by dieticians that allows you to track your calorie intake and learn how to read ingredients and nutrition labels correctly. With this knowledge, you can make healthier choices and incorporate healthier and tastier foods into your diet. Fooducate is a great app for beginners who want to make a change in their diet but don’t know how or where to begin. You can browse through more than 200,000 store-bought food products, as well as menu items from selected restaurants. Entering your choices into your daily diary allows you to keep track of how many calories and nutrients you consume that day. In fact, this app will automatically generate the amount of calories you burn and add it to your diary statistics if you enter the type of physical activity and for how long you did it. Because this app is very user-friendly, it’s really easy figuring out how to use it. A section called “Daily Tips” has a collection of articles on the latest nutritional news and beneficial facts about various foods; facts you might not know about. However, this app only provides nutritional information on barcoded food products, and those from selected restaurants. Because many foods, such as fruits and vegetables, do not have a barcode, you can miss out on important nutritional information on certain foods. A premium feature allows you to compare food products and find healthier alternatives to the ones you may currently be consuming. Scan the barcode of any food product and Fooducate will display its rating on the product, its nutritional content, and even recommend healthier alternatives. 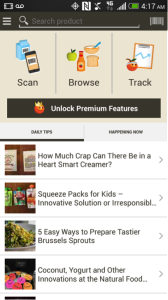 Hopefully, using this app will prompt you to select healthier choices. Another premium feature that really impressed this reviewer was the scientifically-backed explanations of some of the ingredients which may be harmful to your body. These are the ingredients that manufacturers try to hide in food products; for example, high fructose corn syrup, trans-fatty acids, food colorings, and preservatives. This feature is very clear and easy to understand, even if you have no nutritional background. Fooducate, with minor improvements, proves to be a great app if you want to incorporate healthier foods into your diet and loose some extra pounds by keeping track of your diet and physical activity. Cost: Free. If users want to upgrade to Fooducate Plus or Fooducate- Gluten or Allergies, then they can buy the Apps for $9.99/each. Premium features include allergy info, info on genetically modified organisms in products, and personalized ratings for heart health, low cholesterol, hypertension, vegetarian, and vegan profiles. MyDS – short for ‘My Dietary Supplements’ – is a free mobile app that provides you with an easy way to track the vitamins, minerals, herbs and other supplements you take. Developed by the Office of Dietary Supplements at the National Institutes of Health, this new app also provides links to reliable, science-based information on dietary supplements. To use this app, you first need to create a profile and then enter the names and amounts of any dietary supplements you are taking. You can review this stored information any time you want to, such as when visiting your doctor or shopping for refills. 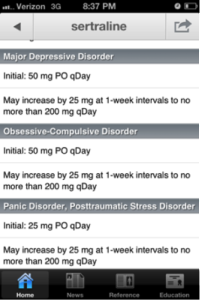 The MyDS app also allows you to add personal notes such as the quantity and frequency of supplement usage. 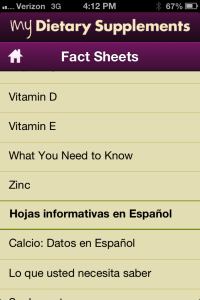 You can display fact sheets, available for various dietary supplements, that serve as a reminder for recommended amounts and also may suggest foods that provide a particular vitamin or mineral supplement. The MyDS app also includes information on health effects, potential interactions and side effects, as well as links to access more detailed information. This app also allows you to enter and save a product without specifying the product’s brand name. This incomplete profile can still be included in the email reports. The reviewer is not sure what purpose this incomplete information would serve and thinks this may be a programming bug. Lose It! is a simple, easy-to-use app designed to help you lose weight and improve your overall health in a sustainable way. You use the app to record what you eat on a daily basis and how much exercise you get. You can also enter your current body weight as well as your desired body weight. Next, you choose to set a goal, such as to lose a pound every week and Lose It! will figure out how many calories you should be consuming to reach the goal. This app provides a large database of a variety of foods and physical activities, and there are several ways in which you can add your own items. You can search foods by brand, add new foods and activities to the database, and create customized recipes. In addition, you can add foods to the database by using your phone camera to scan the barcode on your food package. There are several things I like about this app. It allows you to share your favorite meal with friends and family; it provides a running countdown so you always know how many calories remain for the day; and the app allows you to add a previously logged meal with a single key click. In addition, you can select to have your progress reports emailed or printed on a daily or weekly basis. There are a couple of things that would improve this app for me. The Lose It! database did not have several of the foods and drinks I like; for example, bubble tea and tapioca pearl tea. Also, there is no auto spellcheck. One typo may kill the entire search term, and this can be time consuming and annoying. Cost: Free. Additional cost of $39.99/year for premium features that track other health goals like body fat, sleep, hydration, macronutrients, body measurements, etc. 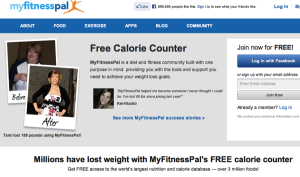 MyFitnessPal is a calorie-counter and exercise-tracker app. It helps you track how many calories you’re eating versus how many you’re burning in a day. This is an important feature because according to numerous weight loss studies and research, the more food records people keep, the more weight they lose. This app was designed around the fact that most of us tend to eat the same foods over time. You can easily add those frequent foods to your food log. The more you track your meals, the easier and faster it becomes. You can add foods to the log by searching the food database, scanning the barcode of a food package to find its match in the database, or entering your own recipe and using the recipe calculator to find its nutritional content. There are options to use either the imperial (U.S./British) or metric systems for measurement. 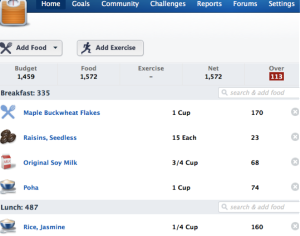 The MyFitnessPal food database contains more than 3,000,000 food items. I found that the database contained most of the foods I searched for, and I was impressed by the variety of foods included, from international cuisine to meals I cook at home. 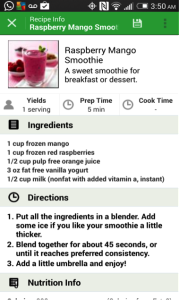 MyFitnessPal provides the capability of sharing recipes and food items uploaded by other users. The default is to keep your uploads private, but if you choose, you can share your personal recipes and food items. This feature makes MyFitnessPal stand out from other apps. The exercise portion of this app contains over 35 exercises, can track both cardio and strength training, and allows you to create custom exercises. I liked the fact that this app allows you to connect with friends and easily track and motivate each other. It provides both daily and weekly overviews. The Weight Watchers’ mobile app provides you with a plan to lose weight by keeping track of points. Using Weight Watchers’ points-based counting system, every meal or food item is assigned a point value. The goal is to stay within your daily quota of points. This review only covers the free features of the Weight Watchers’ mobile app which you can access by going to the weightwatchers.com website. However, if you want all of this app’s features, you need to sign in, become a Weight Watchers member, and pay a monthly subscription fee for this app. If you don’t want to subscribe to Weight Watchers, you can still access and benefit from this app’s free features. Maybe you don’t need to track points but just want to make it a point to eat healthier. You can view many featured recipes, access a couple of free cheat sheets that are great for estimating portion sizes, and email yourself a shopping list to print later. With the subscribed version of this app, however, you have access to more features such as an expanded shopping list and more cheat sheets. 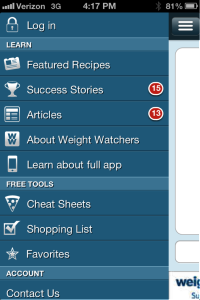 Overall, because the interface is very well done, the Weight Watchers’ app is easy to use and navigate. Real success stories from real people can be a motivating and inspiring read. However, I don’t think there is much value to the Weight Watchers’ mobile app – it isn’t very useful from a weight loss standpoint – unless you are a subscriber. Cost: To get the most out of the Weight Watchers’ app, you will need a subscription to Weight Watchers, which begin at $4.61 p/wk. 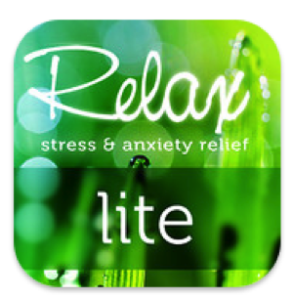 This Apple and Kindle app is one of many available that provide some sort of pleasant image or scenery with accompanying soothing soundtrack while you fall asleep, do yoga, meditate or engage in other stress reducing activities. 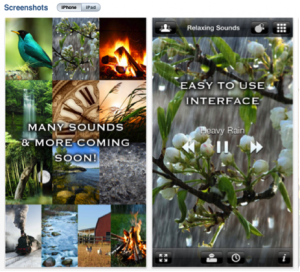 The free version of “relaxing sounds” has four images – a singing bird, heavy rain, a fireplace, and a waterfall, all with accompanying soundtrack. The app has a banner ad on the bottom. You have the option of purchasing additional sounds, as well as paying a $0.99 fee to remove the banner. Reviewers report that the bird soundtrack is good for entertaining pet cats and birds. While this approach to relaxation doesn’t work for everybody, many users do seem to find it helpful. You can select how long you would like your relaxation session to be – starting at 5 minutes and going all the way up to an hour. You can also choose the length of time for each individual breath. I didn’t like how the inhalation segment was shorter than the exhalation and would have liked a way to customize this. In fairness, this may be an option in the paid version. As someone with occasionally restricted airways, I also would prefer the option of a shorter breath cycle. 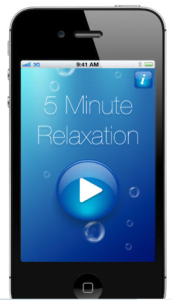 However, I did find the app effective at slowing down her breathing and thus feeling more relaxed. 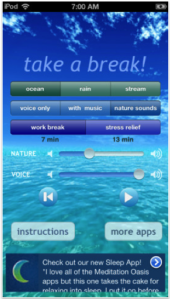 This particular app allows you the option of having a background soundtrack of music or three different nature sounds (ocean, rain or stream) while the narrator speaks. You can customize the volume of the voice and background soundtracks separately. You can also choose to mute the voice completely if you want an unguided meditation session. There are two easy-to-accomplish lengths – a 7 minute “work break” and a 13 minute “stress relief” session. I found the woman’s gentle voice and monologue soothing and quite effective at promoting relaxation. I also liked the fact that the meditations were of a very short and manageable length, yet long enough to be effective. The instructions are clear and reassuring for those new to meditation, or who have found previous efforts to be frustrating. While some may find playing games on their mobile devices a good way to relax, most would probably consider it a stretch to call them legitimate tools for stress reduction. “Balls” by Dan Sayers is the kind of game app that comes up while searching for “relaxation” or “stress relief”. You use your fingers to guide colored lines around the screen. While there are allegedly music and sounds, this reviewer was not able to activate any of them. Other reviewers reported similar results. I found the app briefly diverting, but not useful for relaxation or stress relief. Of 12 reviews, only one said they found it “relaxing” the rest either found it “fun” or disappointing. Both options have a soothing female voice and new age type music. One is meant to help you fall asleep. The other is meant as a five minute break for those wanting a quick meditation before resuming their daily activities. I would be hard pressed to tell the difference between the two – the one to help falling asleep mentioned the user being in a chair, which doesn’t seem like a safe place to have somebody deliberately fall asleep. However, the one meant to be done with the intention of staying awake afterwards seemed effective enough, guiding the listener through a systematic relaxation of different body parts. While not the best free guided meditation app out there, the waking version should provide you with a quick and easy to use way to reduce your stress levels. The Mind Tools app can serve as a resource for new and mid-level leaders. As a new leader you may not know where to start to develop your leadership skills, and the Mind Tools app helps you quickly focus on key competencies, leadership theories, and management strategies to help set a foundation to develop your leadership skills. The app is easy to use, which is great for individuals that may be new to using apps (content can be accessed within 2 clicks) and the content loads quickly. Many of the articles can be read in about 30 minutes and provide a summary of key points at the end. The content provided through the app is also available on the website Mindtools.com, so the app is probably better for individuals that prefer to get information on the go, accessing content via apps, or easily accessing content when a computer is not available (e.g., desk-side discussion with a team member or in the field). All the content on the app is provided through articles, which may not appeal to you if you prefer content delivery in a variety of formats (e.g., audio, video). The app also does not provide any type of interactive features (e.g., taking skills assessment), but these tools are available via MindTools.com. 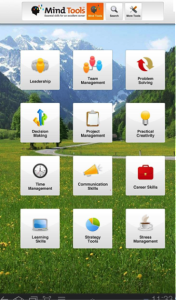 The Mind Tools app provides access to their Mindtools Toolkit which has 12 skill building categories with over 100 articles on areas such as team management, leadership, problem solving, and communication skills. The information presented through the app is easily accessible and concise, allowing you to get resources you need while using your smartphone or tablet. The app compliments the Mindtools.com website which features over 600 resources that include articles, videos, and self-assessments to assist individuals with career development. The app is free and available for both iPhone and Android. You can sign up to receive a free weekly newsletter through the app, which also gives you access to a free Personal Development Plan Workbook. The Mind Tools app has received favorable reviews by users with a 4.6 out of 5 rating and over 350 users (out of 450) giving it a 5 star rating. This app from the American Psychological Association allows you to view the whole magazine for free. 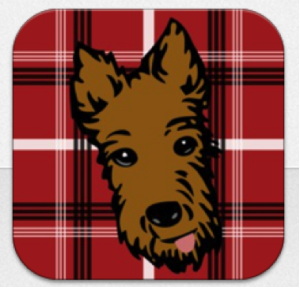 This is different from many other publications’ apps that merely provide samples. Both current and past issues can be downloaded for offline reading. There is a searchable archive of past articles. These articles are written in a clear, easy to read style and contain interesting and useful information on the latest research findings and treatments. This app is recommended for anybody looking for an easy way to keep up with developments in the field.